November is Financial Literacy Awareness Month! As we regroup here at Money Smart Students, what better way to get back into it than to focus on Canadian Financial Literacy Awareness Month throughout November. 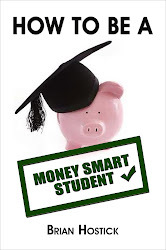 For the next four weeks I'll be providing information and links to resources which - though not necessarily all geared toward students - will come in very handy for people of all ages looking to take better control of their finances. Then - on November 15th - I'll be joining with many other Canadian PF bloggers for a special 'Blog for Financial Literacy' day. We will all be posting about our one best financial tip. It should make for some very enlightening and informative reading. LifeInsuranceCanada.com, Myfindependenceday.com, and Canadian Capitalist will all be listing the participating blogs. I am happy to be taking part and look forward to all the great information to come for my own educational purposes as well. If you have any specific area of personal finance you would like me to touch on this month, by all means please leave a comment and I'll do what I can. If I can't answer your question - I will connect with one of my PF blogging friends who can! Finally - just because it's Canadian Financial Literacy Month, I will make sure to post links and articles which can be useful to readers on both sides of the border. I hope you will use the next 30 days to increase your PF IQ! Cheers! Alright - I'm a Canadian - so why would I bother writing about the presidential debate tonight in the United States? The answer is that 90% of the readers of this website are from the U.S. President Obama and Mitt Romney will be debating domestic policy tonight - and I bet the subject of students comes up at least once or twice. From what I can see from my vantage point just across the border - Barack Obama is the better choice when it comes to policies and ideas for helping students get through these days of skyrocketing tuition and skyrocketing student debt. Heck - Romney said a couple of weeks ago a good strategy for students to help pay for college was to go ask your parents for the money! Really!? I may, or may not, watch the debate tonight. It will probably be the only one that touches on the subject of education. I can't wait to see what they each say and what students and parents think about what they said. Let the games begin! Cheers! A new month has dawned. With it, October brings the beginning of the research and application process for millions of highschool seniors preparing for post-secondary education. Believe it or not - there are hundreds of scholarships which have deadlines this month, but we'll talk about that at a slightly later date. The biggest decision students need to make right now is, 'What am I going to study at college?'. I think the more important question is actually, 'Why am I going to college at all?'. With the spiralling costs associated with college, the decline in the number of well paying jobs in related fields for graduates (How many waiters do you know with a PhD? ), and the overall lack of direction many of today's teens feel, is going to college right now really the best option for you? Are you going to spend thousands of dollars studying something which you might decide isn't what you really want to do for the rest of your life? Is there something else you could do for a year or two which will help you better define what your future goals are and the direction you want your professional life to take? My oldest son, a highschool senior, was born in September. That means he could realistically graduate from highschool and start his first month of college as a 17 year old! I love my son dearly - but I don't believe there is any way that a 17 year old boy can have a firm grasp on what he wants to do for the rest of his life. We've had lots of discussions about what he wants to do. There is a general sense of the field he wants to enter but nothing specific just yet. How do you justify spending the kind of money needed to go to college if you aren't sure what you are studying is what you want to be? A lack of direction has got to be a major contributing factor to the dropout rates at colleges and universities. Students get into their field of study and then realize they don't really want to pursue that area for the rest of their lives. Meanwhile, they've spent thousands of dollars on tuition, living expenses, etc - and for what? The realization that they are heading the wrong way. That's a steep price to pay for a wake-up call. Don't get me wrong with the theme of this post. I believe that a solid college education is the foundation that terrific careers and lives are built upon. However, I think the time has come for students, and parents, to really start looking at exactly where the teenager wants to head with their life - and decide if going right from highschool into college is the best overall option. Now I'm sure some will say there are studies that show actual enrolment drops off by x% every year a student waits to go to college. I understand that. However, if students and parents sit down early (as in the start of senior year early) and make a concise plan of what is going to happen and when, there is no reason a year or two delay in starting college should be the end of furthering their education. Delaying college can give students, and parents, time to save up some more money. It can give the student an opportunity to really think about what course of study they want to pursue. It can also give students extra time to investigate all the options available such as overseas studies. It just may save a few years, and thousands of dollars in expenses, when the student decides they are heading in the wrong direction. A college education can be a stepping stone to a terrific future - but do you really need to go right to college from highschool? That's a question only you can answer yourself! What are your thoughts on this subject? Did delaying the start of college help you to better understand where you wanted to go with your life? I would love to hear what you think!